Designed for tasks that require great grip, dexterity, tactile sensitivity, and cut and puncture resistance, these leather work gloves have a stretch-knit backing and a Velcro closure at the wrist for better fit and excellent comfort. Choose from either the WorkWear Work Glove, which features a blended aramid liner for better comfort, or the WorkWear Plus Work Glove, with its full aramid lining for even more cut and puncture protection. 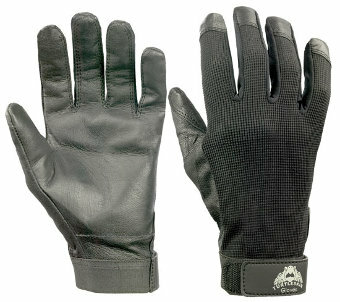 These work gloves deliver superior comfort and dexterity with a blended aramid liner for good protection in palm area. These work gloves feature superior protection with a 100% aramid-lined palm that wraps over your fingertips for better cut and puncture protection. Palm is puncture resistant to 267 grams of force tested with a 28-gauge hypodermic needle.